Alexis Kokolias (left) and Karen Clark Roske at the Generation Homes Design Center. was a perfect fit for Generation Homes’ designer Alexis Kokolias. Working out of the Generation Homes’ design center in St. Augustine Beach, Kokolias closely coordinates with the construction team on engaging and custom concepts ranging from colors, to cabinets, countertops, fixtures and flooring, providing an inspiration that can be applied to meet a homeowner’s vision and budget. Real estate veteran Karen Clark Roske is also contributing her experience and talent to the Generation Homes’ team as business development manager. Generation Homes builds custom homes in premier communities along the First Coast from Ponte Vedra Beach to Hammock Beach, including Sea View, Vilano Beach, Flagler Beach, Beach Haven, Anastasia Dunes, Magnolia Dunes, Marsh Creek, Sea Colony, Sea Grove, and Whispering Oaks and on private coastal lots. “I enjoy the process of helping Generation Home customers realize their ideas and dreams. This begins with the initial meeting where we listen, through the building process to the walk-through and closing,” Roske said. So, according to the latest Best in American Living Awards what are new homeowners looking for in 2018? Clean details. Clean and simple lines and detailing over their ornate counterparts, making homes feel fresh and uncluttered. In addition to coastal or beach colors. Gray is still trending, and white is in it for the long haul. There is also an increase in monochromatic designs that incorporate multiple textures. For example, a white kitchen with quartzite countertops, a white shiplap ceiling, white cabinets and airy white window coverings creates a clean and multi-layer look that compliments itself. 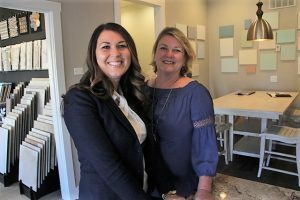 “Alexis’ relaxed manner but energetic approach to helping homeowners lends itself to a collaborative, creative and fun design process,” noted Generation Homes President Cora Johnston. Experienced and consistent and approachable makes working with Generation Homes a distinctive experience that results a space that truly embodies a homeowners’ personality and lifestyle. Growing up on the First Coast has given Roske an insight into the real estate market that benefits homeowners early in the process of building or remodeling their home. She decided to follow in her parents footsteps and began a career in residential new home sales. Karen joined the Generation Homes team in 2017. Her father, the late Charlie Clark, was inducted into the Florida Housing Hall of Fame and one of the industry’s most sought-after consultants on local housing/building statistics, trends, analyses and forecasts. Now some 30 years later she’s assisting homebuyer’s with design to bring their custom home dreams into reality. “I’m pleased to be aligned with fellow team members who share the same love of home building,” she said. Kokolias’ passion for design began at a young age. She was constantly rearranging her bedroom and would paint it several times over the course of a year. A St. Augustine native, she received her degree in interior design from the Art Institute of Fort Lauderdale. “I believe in bringing the outside into every space, resulting in a lively, uplifting coastal feel to the interiors,” added Kokolias. Her love for design was cultivated through her education, love of travel and working as the lead-designer on numerous high-end projects. To learn more about Generation Homes, contact Elaine Raynor (904) 584-0038 or Jenni Johnston (904) 806-3398.